AUSVEG and PMA Australia-New Zealand Limited (PMA A-NZ) have again united to deliver the joint industry conference and Trade Show, Hort Connections 2018. 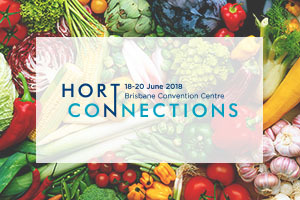 Hort Connections 2018 will be held at the Brisbane Convention and Exhibition Centre 18-20 June 2018. Members in the horticulture industry will be inspired to aim high, with the theme of ‘halving waste and doubling productivity by the year 2030’ headlining the conference. The event will cater to buyers and sellers from every segment of the fresh produce and floral supply chain including seed companies, growers, packers, processors, shippers, importers and exporters, wholesalers and retailers, foodservice, associated suppliers to the industry, and many more. Following on from the successful Hort Connections 2017, this year’s event is set to become the most influential space for networking, education and business for the entire fresh produce industry. Visit the Peracto stand in the Trade Hall and talk to our friendly staff.